5K Phil is back and needs your help! 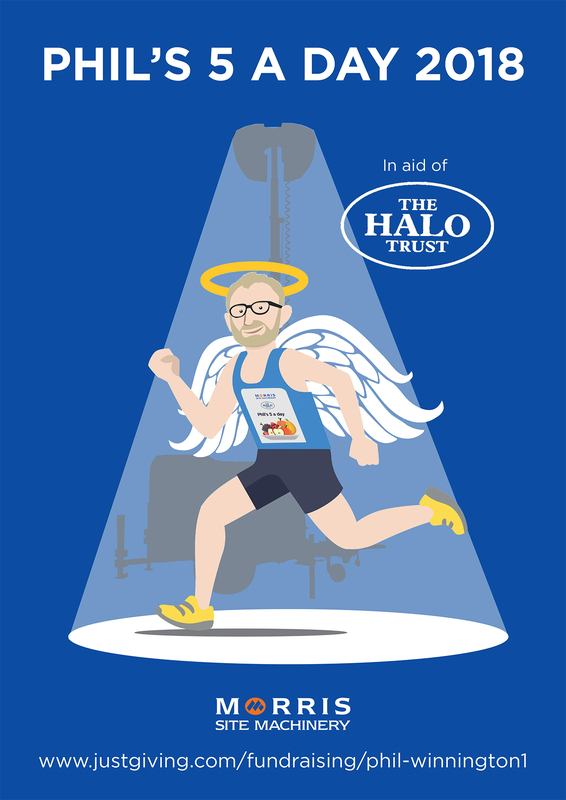 Phil Winnington, our Morris Site Machinery International Business Director, is back with his ‘Phil’s 5 A Day’ charity challenge which sees him running 5K every day for 5 consecutive days in aid of The Halo Trust. The international charity helps rebuild lives and livelihoods in countries like Syria by clearing landmines, unexploded bombs and the deadly debris of war. Raising money for the Halo Trust this year has an added touch of meaning to the company as our new lighting range is also named Halo. The charity is inspirational in the work it completes so raising money to help them continue improving people’s lives is enough to keep Phil running. Phil is looking forward to continuing the movement started last year. He enjoys not only the sense of achievement having run the distance but conversing with colleagues in a more relaxed environment, if we’re not too out of breath! Phil and his Morris colleagues and friends will be ‘running and raising’ from 31st July to 4th August across five different Counties and at 3 of the companies locations including Gosberton in Lincolnshire, Four Ashes in Wolverhampton and the Morris and Co Head Office in Shrewsbury. To help Phil beat his phenomenal donation total from last year, click here. Morris Site Machinery hailed Bauma 2019 as it most successful international show to date after it generated worldwide interest and strong business leads for its top-class equipment. One of the country’s leading site machinery businesses has agreed to acquire the flagship site at i54 adjacent to Jaguar Land Rover at Junction 2 of the M54. Morris Site Machinery will show it means business on the international stage when it debuts two new portable lighting products and showcases world-class equipment at Bauma 2019.